Alison Wall died suddenly on Tuesday morning. Alison was an ardent campaigner for the improvement of Whitchurch and an active supporter of many groups. Alison had been a Borough Councillor for 12 years and actively supported campaigns, such as the successful one for the retention of the post office. She was a member of many groups such as the Garden Association and entered photographs in last Saturday's show, she was a member of the Whitchurch Association and took an active part in the Health Check which is now helping to improve the Town. Her funeral is Thursday 30th August. Jane Acott and Chris Benton have three reasons to celebrate. They have just completed 2 years as licensees at the Harvest Home, the pub is now listed in Basingstoke's Local List of Buildings of Architectural or Historic Interest; the building is now considered to be a Locally Listed Building (details are here - on page 16 ) and Jane has just received the Mayor's Trophy for producing the best floral display in the Town (picture left). The pub has really taken off since Jane and Chris took over. In addition to the warm welcome and excellent ales, there's special food offers each day (less Mondays) in addition to the normal delicious menu, activities of all sorts and the place looks very pretty (from outside and inside too!). Details of the menus, activities and general news is in the monthly newsletter and the website. A record number of entrants in recent years produced a superb display at the Whitchurch Garden Association's Annual Produce Show in its new venue. The rain didn't manage to discourage lots of interested visitors who came to see the excellent display. The Baptist Church played host to the show for the first time a provided a pleasant background for the displays of floral art, flower, fruit, vegetables, culinary items, wine, handicrafts, children's work and photographs. Several new entrants took part and there was an increase in the number of photographs and culinary items, which produced some keen local competition. Full results are here and more pictures here. Trophies galore were very kindly presented by the Mayor, Steve Robbins. 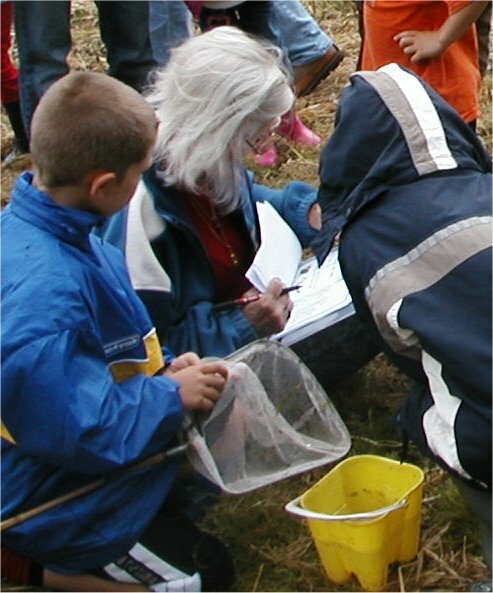 Despite the threat of rain, a good crowd of children visited the Meadow for pond dipping. Finds were recorded and more than just fish were (temporarily) captured. Two children living in the Town and attending the same class at Whitchurch Primary School have been diagnosed and are being treated for Leukaemia. Their friends and family and those of another child on the Isle of Wight are organising a sponsored bike ride around the Isle of Wight. The ride is over two days covering up to 90 miles on 11th and 12th of September. The ride is to raise funds to split between the Piam Brown Ward at Southampton Hospital where the children are being treated and the Wessex Cancer Trust. Julie Myall is currently trying to raise funds both privately and from companies, if you or your company would like to help, please use this link to send an email to Julie. Another first for the Millennium Meadow, as it hosted a day out on Friday for children who made dens. Carers and children rounded off the morning with a barbeque. Plans are afoot to enhance the educational aspects of the Meadow by the adding new notice boards. Brian Shrubshall and Paul Musty are about to start work on the project. The e.office, which has been advertised variously in Update and the local press, is coming. The office, at the prestigious, 1 Winchester Street, address, is currently being decorated ready to provide space for home workers and the Town Centre Improvements Manager. The office will be available for rent by the half day with facilities such as colour photocopying and computer file backup. If you want to know more press here. Contact W4W using the contact page. See what the Basingstoke Gazette and Andover Advertiser say about this. Parent and toddler activities are happening every Friday morning in August in the Methodist Church. A bouncy castle and lots of toys, all for only £1 per family, 10am - 12 noon. The Millennium Meadow at last saw just enough sunshine for an organised event. 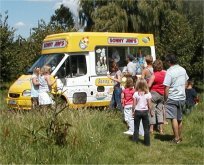 A large crowd enjoyed Mr Punch, ice cream and playing in the long grass. Next Wednesday, 15th, there's Pond Dipping on the Meadow and Mr Punch is back in 2 weeks, 22nd. 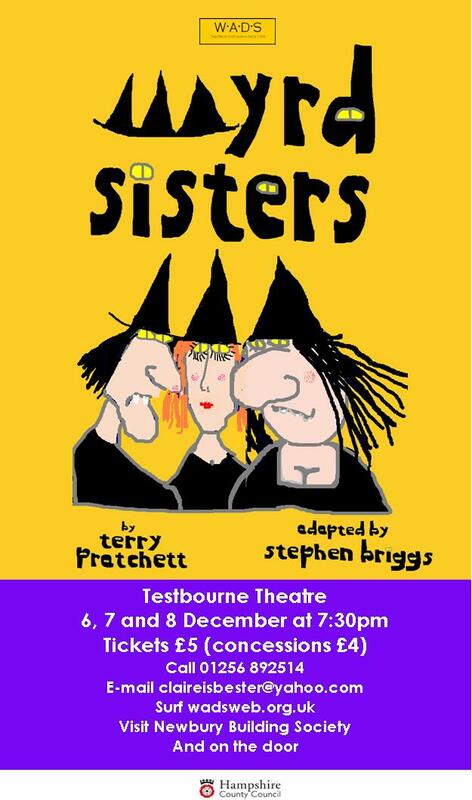 WADS have just launched a wizzy new website,wadsweb.org.uk, which includes full details of their next performance, Terry Pratchett's Wyrd Sisters, which will run from 6 - 8 December. Workshops are running every Tuesday at 8pm in Testbourne Community Suite if you would like to take part. WADS has been active in the Town since 1958 and its recent performances have been sellouts. So purchase your tickets for the next event from the Newbury Building Society or visit WADS Box Office outside the Town Hall on the 2 Saturdays before the show. More recently, WADS has moved into street theatre with Has anyone seen my camel? last Christmas and an earthy performance to celebrate Potato Day. The Parish Hall AGM was the most well attended for many a long year with around 60 Townsfolk anxious to make their views felt. Reg Smith has estimated he cost of renovation as between £40 - 50,000 but this would produce a stunning new hall. There are however serious doubts about the future of the Parish Hall. The lease lapses in 6 years and there are strong fears that the Church will increase the rent or even sell the Hall then. Cllr Titcomb, representing Whitchurch Town Council, said that, given the existence of the new Gill Nethercott Community Hall, the WTC would not support the refurbishment unless new users could be found; existing groups such as Silver Threads and the Country Market could use the new hall. Members of various groups pointed out that the new hall was not really large enough for their activities. They also cited issues around the higher cost of the new hall and the fact that it is not as central as the Parish Hall. The meeting agreed to consult with solicitors with the aim of pressing on with the refurbishment. Gill Webb, Chairman of the Hall Committee, called for more support and pointed out that the Committee needed a Secretary. After meeting note: The solicitor's view is that the Church does have the right not to renew the lease. However there is a body of opinion in the Town that, because of the complex history of the relationship of the Town and Church, if sufficient pressure is placed on the Church, it may not exercise it rights. Mike Kean, who has lived in the Town for 23 years, has been elected Chair of the Chartered Institute of Public Relations (CIPR)'s Wessex Region for the second time, having previously held the post 1998/9.Mike, who is in his 50s, lives in the Town with wife, Jan and has two grown-up children. Mike,Head of Communications with Southampton-based Mott MacDonald, currently manages a 12 strong PR Team, working mainly for the Highways Agency, managing and maintaining the motorway and trunk road network in central southern England. Prior to joining Mott MacDonald nearly six years ago, he was Head of Corporate Marketing and PR at Hampshire County Council. Before that he worked for consultancies in London and in Brussels for an American Oil giant. He said: ”This is really a very exciting time for the Institute as membership is on the increase and demand for PR services is growing all the time. Reputation issues have never been more important than they are now and I hope to spread the message about the importance of good, clear communications in our society today”. For the second time in recent years, Basingstoke and Deane Borough Council has stepped in to plug a funding gap created by Hampshire County Council's withdrawal of subsidies to rural bus routes. On Tuesday evening, all members of the Transport and Planning Committee endorsed the recommendation of its Cabinet Member, Councillor Horace Mitchell, to provide the subsidy for the weekday evening 76 service. The service runs between Andover and Basingstoke and serves Hurstbourne Priors, Whitchurch, Laverstoke, Overton and Deane Gate. This decision means that the service is safe unit 1st April 2008 - beyond that the future is not clear. Councillor John Maxwell, who represents Whitchurch and Hurstbourne Priors, did not seem aware of the HCC decision when contacted by email. The full story to date is at www.76bus.org.uk. Mum and daughter, Lyn and Laura Fuoco both had a bad hair day and raised £200 for the Whitchurch Youth Project and the CLIC Sargent children's cancer charity. Laura who is just in her fourth year of remission from cancer and her mum, Lyn, both sportedflowing locks (see right) until they joined forces with Whitchurch's demon barber, Mike from Taylor Made Men's Grooming, for a sponsored hair trim at the Friday evening Whitchurch Youth Club Meeting. Mike kindly donated his time but was unable to reward either participant as he does his normal clients with a beer (for male customers) or a lollipop (for boys). They were both able to keep the clippings (see left) and forward the sponsorship moneys to the 2 deserving causes. Lifeline for Evening Bus Service? Basingstoke and Deane Borough Council's Portfolio Holder for Transport is likely to recommend to his cabinet colleagues that B&DBC; pay the subsidy to keep the 76 evening service running until the ned of the financial year. The Transport and Planning Cabinet meets on Tuesday and, by invoking emergency rules, Councillor Horace Mitchell could persuade his colleagues to take over the funding which Hampshire County Council seems determined to remove. The need to use emergency procedures emphasises the speed with which HCC has made its decision, without consultation. If BD&BC take over the paying of the subsidy, it is only a temporary measure and, if the service is really needed, pressure to retain the payment must be maintained. Whitchurch will benefit from having two beer festivals this Autumn. W4W is working with the Town's landlords to have as many Hampshire brewed real ales available as possible over the weekend of 26 - 28th October. The Whitchurch Pubs' Festival was last held in the Town many years ago. This time the beer will be supplemented by local produced food featuring sausages and potatoes from the Whitchurch Potato Day. Meanwhile CAMRA is planning to expand on the Whitchurch Beer it ran last year in the Long Meadow Sports and Social Centre. This year it will be over 3 days, 23 -25th November, and incorporate real sausages in various traditional dishes together with entertainment and an associated Town Pub Trail with prizes. For more see the event website. Both events are covered in the events diary which will be kept up to date as detailed planning for each of each of the festivals progresses.